Fun Fact: Aakrosh marked the return of Priyadarshn to serious cinema. Why it Made News: The film was said to be a copy of English film, Mississippi Burning. CBI officers Sidhant Chaturvedi (Akshaye Khanna) and Pratap Kumar (Ajay Devgn) are given the case of three missing students from the village of Jhanjhar. 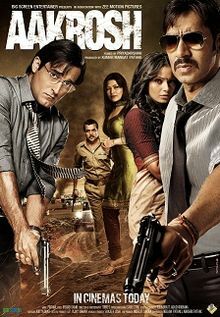 Ajatshatru Singh IPS (Paresh Rawal) is a ruthless police officer and his wife, Geeta (Bipasha Basu) reveals that she witnessed the killing of these boys by a local politician helped by her husband. With the help of Geeta and some intense investigation, Sidhant and Pratap manage to catch hold of the guilty criminals who are given a heavy sentenced.